Is it too presumptuous to call this the “perfect” pie crust? Especially since I’m not a baker who’s tried a great many of them? It’s perfect for me, anyway, because it’s so easy, so sweet-salt-buttery-flaky, and because it uses all butter instead of shortening. And although it’s a fairly standard recipe, I found it via Martha Stewart many years ago, and everything she does is perfect, right? How do you make your pie crusts? If you have a different perfect method, I definitely want to know. Yesterday, July 5, marked Seattle’s traditional first day of summer, and it arrived right on schedule. (Apparently the “meteorological cognoscenti” pin the date as July 12, but this year it was indeed July 5. Note also in that article that it is expected to last through August 15. Yay?) My sister and I celebrated by taking the girls to Molly Moons for ice cream, then swinging in the park, then to the local wading pool. We were on summer slow time, little kid time, and walking a little less than a mile and a half took us more than an hour, even with the incentive of ice cream cones moving us along. Look, bumblebees! Leaves with holes! A leaf in the shape of a magic (better still, say it like my just-now-four-year-old: “magict”) key! The girls squatted on the sidewalk to peer into cracks, point, and consult. You cannot rush past any of those things. We did not rush past any of them. Here’s where you want to rush in the summertime: in the kitchen. And so now that it’s summer, to return to my original point, you’ll be needing an easy pie crust. This is mine. I make it using a food processor. If you don’t have a food processor, I recommend following this method where you grate frozen butter directly into your flour mixture. (I have never, ever understood the directions for using two knives to make a pie crust.) If it gets too warm/soft/sticky at any point, just pop the dough in the fridge for a few minutes before continuing. Easy peasy. 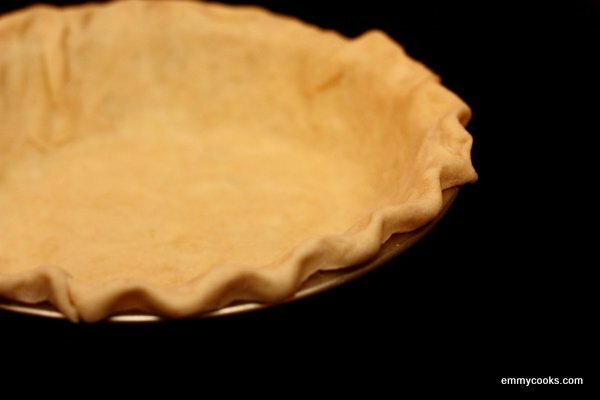 Easy Perfect All-Butter Pie Crust: Drop a couple of ice cubes into a cup of water and set aside. In the bowl of a food processor, combine 2 1/2 c. flour with 1 tsp. kosher salt (or 3/4 tsp. regular salt) and 1 tsp.-2 Tb. sugar (I like to use the larger amount for a sweeter crust for fruit pies). Pulse a few times to mix the dry ingredients. Add 1 stick of cold butter, cut into 1/2 cubes, and pulse about a dozen times to break it up (there should still be some large pieces intact). Add 2 Tb. of the ice water and pulse a few more times. Continue adding water a tablespoon at a time, pulsing to blend. The dough will still be a little crumbly, but does it hold together if you squeeze a handful? If so, you’re done. If not, add a few more Tb. water, 1 Tb. at a time, pulsing the machine a few times and checking a handful after each addition of water. The first time you make a pie crust, I’d say to err on the side of adding more water if you’re not sure about the texture; you can always use more flour to roll the dough out later if you need to. Also, one more word of warning, don’t run the food processor too long or pulse it too many times because you want pea-sized chunks of butter to remain when you’re done. When a squeezed handful of crumbs holds together well (and the dough is sticking together in small and large pieces without a lot of loose flour in the bottom of the bowl), evenly divide all the crumbly dough out of the machine onto two sheets of plastic wrap. 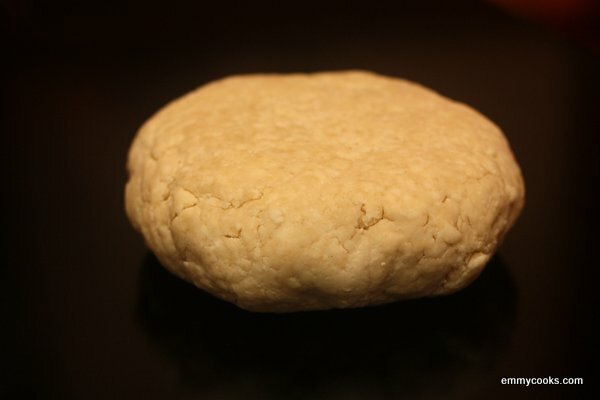 Wrap the dough, squeezing each piece into a disc 3/4″ high. Refrigerate at least an hour. Roll out between sheets of lightly floured wax paper, peeling them off as you transfer the dough to your pie plate. Holes? Cracks? No problem, just grab a bit of dough from the outside edge and patch them right up. This recipe makes a double crust; if you only need one crust you can halve the recipe or make it as written and freeze half the dough for another occasion. This entry was posted in Baking, Desserts, DIY, Food, Recipes and tagged I love pie, kids love pie, pie crust recipe, slow summer days, summer means pies, walking with little kids takes forever but you see so many things you wouldn't have noticed if you were walking faster on July 6, 2012 by emmycooks. Good points! I definitely think making the crust by hand (w/o a food processor) is a good idea though. That way you can feel the moisture levels and make sure there are some good pieces of butter in there for flakiness. Thanks for sharing Emmy and I love the way you broke down the steps in making the crust. I am on my way out the door to the Farmer’s Market for my first Southern peaches of the year and I think they will blend well with your pie crust. Love the descriptions of your girls and your progress on your walk! That is a perfect description of kid time and a perfect way to celebrate the first day of summer. Wish we had the same weather – we are on our 10th day of over 100 degrees. Not typical of St. Louis in late June/early July. I used to use that pie crust recipe all the time! It’s a keeper! Oh, I love this recipe. I really do need to get a food processor to make my cooking-life a little easier. And when I do… hello this pie crust. This is mostly like my pie crust, about which I’m not completely confident. The main difference is the pea-sized butter in the dough. Do you still see those after rolling out the dough? My pie crusts are okay, but I’d like them to be more flaky and when I patch holes on the sides it often doesn’t hold (bottom fine though). Rolling out after refrigeration is also a bit of a pain: I’ll definitely try the parchment paper approach next time! PS we don’t have shortening here, but I believe it’s like margerine. I always use butter! Yes, I think the crust is best (meaning flakiest) if you still see pea-sized chunks of butter (they may look even bigger) after you roll out the dough. And shortening is something even stranger than margerine–I really don’t know what. Fake lard? You had me at all butter! This looks delish!